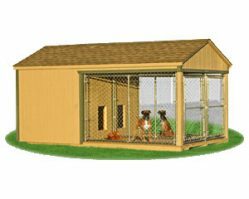 No matter what your animal shelter needs are, we probably have a structure that’s perfect for the project at hand. 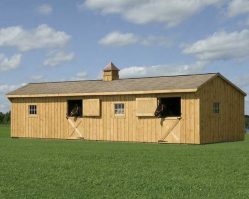 Our animal structures come assembled and delivered to your yard, pasture, or prepared foundation. Our broad line of shelters cover most farm animal needs. Do you need exotic animal pens (llamas, alpacas, camels, buffalo, etc.)? No problem. Just give us a call at (330) 332-9940 and let us know what features you’re looking for in your new structure. We can custom build just about anything you can think of, and we’re willing to bend over backwards to satisfy our clients and meet their needs. 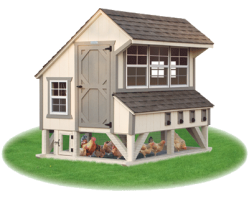 Although we specialize in horse barns of all sizes, we sell a lot of chicken coops and dog houses so there are always a few of those on our lot for your immediate inspection. If we don’t have what you’re looking for in stock we will get it quickly for you. Stop by and take a look. We would love to meet you!